The green is pretty awful but other than that, nice work. The scroller is a little bit too big imo, but its very nice!! rulez added on the 2008-06-10 22:22:21 by ɧ4ɾɗվ. oO, great stuff <3 ! rulez added on the 2008-06-10 23:47:22 by Bhl! Wow. 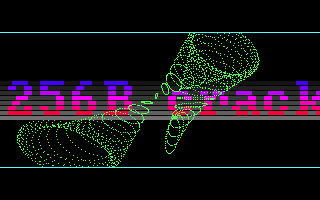 Not just a usual 256b intro but something entirely different that I love a lot, the scroller with the nice colors, the great smooth dots, the feeling of completeness with some sort of retro design in tiny space. Very very well done! this reminds me of the Amiga Bootblock intros.. Damn prix you surly are my small size code hero! This one is special! Oldschool in new code... YEAH! Pretty cool! Love these dots! not super fan of the colors but they match the retro style. Nice to have 2 things on the screen. Cool, except it bugs here. I get vertical yellow stripes in the area behind the scroller, which make it look super ugly. Pretty damn good. Needs some shadebobs tho. Nastepny krok - kilkuczesciowe demo w 256b? Man that's a big show for such a small file! Not bad. Had to use DOSbox. Looks like early Amiga stuff. This is the kind of stuff I used to do when I first started doing demos....except not hardcoded or 256 bytes!! Rulez this is an awesome release. I love the colours you have chosen. Really nice!! Amazingly put together. wow. a 256b worth seeing! the way to do it. Thumb up for this one. :) Good work! Hey look, a cracktro that's interesting. page created in 0.017779 seconds with 15 queries.